Save up to 90% on global cellular phone service with zero roaming fees. Comes with free $10 airtime with multiple numbers available, plus free shipping. Comes with free $10 airtime with powerful global data coverage, plus free shipping. Compatible unlocked mobile devices you can take anywhere with you when you travel. Enjoy seamless coverage in USA, Canada, Mexico, Europe, Caribbean & more! Can't see your destination? Check back often as we're continually expanding our coverage. Valid for six (6) months & renewable. Minimum requirement: Unlocked 2G GSM phone. iRoam Cellular Roaming - How does it work? The concept is simple - enjoy seamless coverage in the USA, Canada, Mexico, Europe, Caribbean & more while saving up to 90% in roaming costs when compared with your celular provider. 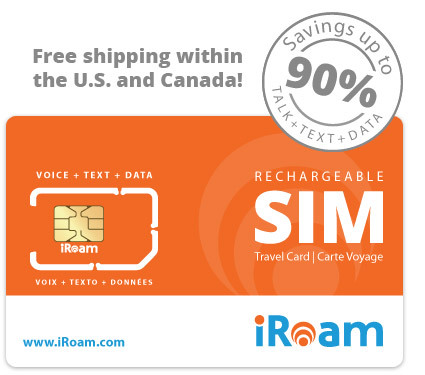 The iRoam international SIM card is a rechargeable, pay as you go service. There are no roaming fees or contract, and it comes with free shipping plus a money-back guarantee. We provide standard, micro, or nano SIM cards. Once you complete your purchase, your iRoam SIM card will arrive within 5 to 7 business days. If you want it delivered sooner, express shipping is also available for a minimal fee. 1. Your phone must be UNLOCKED. As long your as your handset is "unlocked" (is not exclusively provisioned to work with a unique carrier), you can use it with any iRoam International SIM card. Don't have an unlocked phone? No problem! Get the unlocked Samsung A157 for only $49 (operable anywhere iRoam has service). We recommend purchasing a compatible and unlocked 2G/3G GSM Quadband cell phone from us as we can best support it in case of emergency. 2. Verify the BAND FREQUENCY where you plan to travel. 3. Your device should have a SLOT for a SIM card (regular / micro / nano). This includes smartphones, iPads, iPhones, personal hotspots, data sticks, and some laptops. Don't forget to activate your SIM card before you travel! For security reasons, your new iRoam SIM card will be shipped to you disabled. Prior to your departure, please remember to activate your SIM card online or simply call our customer service and we would be happy to do this for you. Once you activate your SIM card, you can start using the service. It's that easy! Click here for quick and simple tips on how to use your iRoam international SIM card. If you need help while travelling, simply dial 611 from your cell phone (free call) and you will immediately get connected to our customer care. Top up on the go! Dial 611 from your cell phone - This is a free call from your iRoam enabled cell phone from anywhere in the world. TIP: Sign up for Auto Recharge and never run out of credit when you travel. You can always check your current balance by dialling *301# and pressing the Call button from your iRoam enabled cell phone. Your balance will be displayed on screen. Unlike with other roaming service providers, you can use your iRoam international SIM card for six (6) months and never lose your minutes. After your trip, you can use as a local SIM in the U.S. or Canada. You can always renew your iRoam international SIM card for a minimal fee of $14.95 and keep your same number. iRoam is a prepaid, convenient Global Talk + Text + Data cellular phone service with exceptional coverage and rates in the USA, Europe and globally while saving you up to 90% in roaming costs when compared with your cellular provider.